An inspector for the physical education department in the Delhi school system, Ram Karan supports his widowed daughter, Anita and eight-year old granddaughter, Asha, by collecting bribes for a Congress party boss. On the eve of Rajiv Gandhis assassination, one reckless act bares the lifetime of violence and sexual shame behind his dingy public career and traps him in a farcical but terrifying, political campaign. An astonishing character study, a portrait of a family and a country-tormented by the past, An Obedient Father recalls Dostoevskys guilt-ridden anti-heroes. Corrosive, funny and frightening, this is a stunning delight. 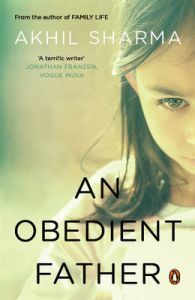 Akhil Sharmas debut novel, An Obedient Father, won the 2001 PEN / Hemingway Award. He has also published stories in, among others, the New Yorker, the Atlantic Monthly and the Best American Short Stories anthology.